India Gupta Empire - HISTORY'S HISTORIESYou are history. We are the future. 2. Beliefs: Why do people behave the way they do? Background: When the last of the Mauryan kings was assassinated in 185 BCE, the Mauryan empire collapsed. In its place, small kingdoms arose throughout India. For nearly 500 years, the various kingdoms warred with each other. In the northern territories, when a ruler named Chandragupta I ascended the throne in 320 CE, a new empire arose. He revived many principles of Mauryan government and paved the way for his son, Samudragupta, to develop an extensive empire. The Gupta territories expanded so greatly under Samudragupta's reign that he has often been compared to great conquerors such as Alexander the Great and Napoleon. Samudragupta was more than a great warrior, however, he was also a lover of the arts. Engraved coins and inscribed pillars from the time of his reign provide evidence of both his artistic talent and his patronage. He set the stage for the emergence of classical Indian art, which occurred under the rule of his son and successor Chandragupta II. Chandragupta II gave great support to the arts. Artists of every kind were so highly valued under his rule that they were paid for their work, a rarity in the ancient world. It is probably no coincidence that the sort of monetary compensation distributed to the arts during the reign of the Guptas resulted in advances in literature and science during the period as well. Gupta literature spread beyond India to Greece and Persia. In fact, the famous story of "Aladdin and his Magic Lamp" is based on a Gupta folktale. Much of the literature produced during the Gupta dynasty was poetry and drama. Narrative histories, religious and meditative writing, and lyric poetry emerged to enrich, educate, and entertain the people. Formal essays were composed on subjects ranging from grammar and medicine to math and astronomy. With the decline of the Roman Empire, the art produced during Gupta rule was some of the very finest being created anywhere in the world. Above, the remains of Nalanda University, the world's first. Along side of the artists and writers, scholarly research and study was encouraged and supported. It was during Gupta rule that the world's very first university was established. In fact, Indian universities from this time were so well esteemed that they were attended by students from as far away as Greece and China. 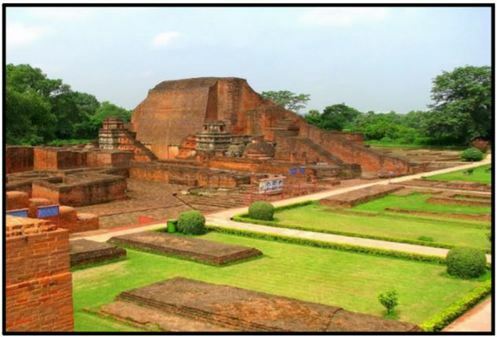 The university at Nalanda, pictured below, instructed students in science, astronomy, medicine, and logic, as well as both Buddhist and Hindu philosophy. It was so large that it contained eight libraries, three hospitals, and a monastery. The libraries at Nalanda were so vast and contained so many Buddhist texts it is said that they burned for three months after being sacked by invaders in the 13th century CE. With it's emphasis on education and establishment of great libraries, scientific discovery found a home in Gupta India. Gupta mathematicians came up with the decimal system and were the first to use zero as a number. It was during Gupta rule that Aryabhatta, a scientist ahead of his time, went out on a limb and proposed that earth was a rotating sphere. He also used math to calculate the approximate size of the earth and determine that the length of the solar year was 365.358 days - only three hours over the figure calculated by modern scientists. During Gupta rule, magnificent architecture, sculpture, and painting developed along side of the many scholarly achievements. Among the greatest paintings of this period are those found on the walls of the Ajanta Caves in the plains of southern India. The paintings illustrate the various lives of the Buddha. An 18-foot statue of the Hindu god Shiva was also found within a Gupta-dynasty rock temple near Bombay. Today, the Gupta Period of India is not thought of as a time defined by enormous wealth or elaborate trade activity. Instead, the Gupta Period is remembered as a time of great creativity. Flourishing arts, fabulous literature, and great scholars all called the Gupta Empire home. And, today, it is those things that are best remembered from that period of India's history. What are at least three things that made the time of Gupta rule India's Golden Age? Though considered India's Golden Age, village life during Gupta times remained simple. The Gupta Empire: The Gupta Empire ruled from 320 - 500 CE. It existed at about the same time as the Roman Empire (Though, by the time the Gupta Empire arose, Rome was already in decline. ), and it dominated northern India. The Gupta Empire was neat. Local military squads protected villages from bandits and raids by. Each squad was made up of one elephant, one chariot, three armored cavalrymen and five foot soldiers. In times of war, all the squads were brought together to form the royal army! People were happy during the Gupta period, so happy that it is often referred to as the “Golden Age” of ancient India. A "Golden Age" is a period of time when the arts and the economy of an area is at its peak. During the Gupta period, people had religious freedom. They were given free medical care that even included simple surgery. Gupta rulers abolished the death penalty. Instead, criminals were fined for any illegal acts. Creativity was rewarded during Gupta rule. Money was given to writers, artists, and scholars to encourage them to produce wonderful work, and they did. Very few of the common people were educated, but the Gupta Empire had many universities. In fact, India boasts the creation of the world's first universities, and students came from as far away as China to study at Indian schools! Homes: While public structures such as temples could be quite grand, homes in Gupta villages and towns were mostly one room huts made of wood or bamboo, with thatched roofs. Even the palaces were made of wood! Larger homes, however, had several rooms and balconies. Gupta Villages: Streets between the homes were narrow and twisted. Stalls for things were located on both sides of the street. People mostly walked where they wanted to go inside their village. Villages were very noisy places. Not only were they full of happy, busy people, they were full of animals. A monkey might sneak up and steal food right out of your hand! Imagine coming home from the market, and telling your mother that the monkeys stole the food you bought, again! Art: During Gupta times art was well supported and, as a consequence, painting, sculpture, and metal work all thrived. Painters' subjects included gods and other religious themes and was created on long scrolls. Sculptors created statues from wood, stone, bronze, and terracotta clay. Most sculptures honored Hindu and Buddhist deities. In addition to their accomplishments in painting and sculpture, Gupta artisans were especially well regarded for their metal-work. Gupta kings controlled huge mines of gold, copper, and iron. Gupta. ironwork was especially outstanding. Even today, iron statues from this period show very little rust! The "Iron Pillar of Delhi," pictured, is a fine example of advanced iron work during the Gupta period. The pillar is over 1500 years old and shows no signs of corrosion. Jobs: Most people during the age of the Gupta rulers worked in agriculture. In the Gupta Empire, wheat was the main crop, and they kept cows for milk. Cotton was grown and cotton fabric was a sought after trade good. The expansion of the empire, however, provided opportunities outside of agriculture. As the empire grew, many went to work building roads and other public structures. Roads built during this time were built with care and precision. Signs told travelers where they were. The roads also powered trade by connecting India to China and to lands east of the Mediterranean. As in ancient Egypt, those people working for the betterment of the public were paid for their work, a rarity in the ancient world. Gupta era math and science was led by Aryabhata whose calculations and observations were centuries ahead of European counterparts. Science: As mentioned earlier, the Gupta Empire invented the idea of a university (though they did not call their schools by that name). Along with that emphasis on education came great advances in math and science. Gupta scientists believed the earth was a sphere and rotated around the sun. They also figured out that the solar year had 365.358 days. (Today, our scientists think it’s probably more like 365.242, which means they only missed by three hours!) They were great with math. Ancient India gave us the number system we use today, the base 10 system that includes nine digits, the zero, and the decimal point. Food: What did they eat? The concept of breakfast did not exist. In earlier times, meals were both vegetarian and non-vegetarian, depending upon your religious beliefs. After the coming of Buddhism, Jainism and other pacifist (peace-loving) religions, and after reforms took hold in Hinduism, vegetarian food became the norm for as much as half of the population. In the Gupta Empire, Indians mostly ate vegetables, cereals, fruits breads, and drank milk. School: In India, schools are often called ashrams. During the Gupta period, older kids who went to school lived at the ashram. School life could be tough. You had to do everything yourself. There were no servants. Even princes had to wash their clothes, cook their food, and follow a rigorous course of studies. Education, then as now, was highly valued. Students had a lot to learn. They studied math, science, engineering, literature, art, music, and religion. Marriage: In ancient India, the most popular form of marriage was when potential grooms assembled at the bride’s house and the bride selected her spouse. There were other types of marriage as well. There were marriages of love, and of abduction (kidnapping). Sports and Games: Ancient Indians invented many of the games we play today, popular board games like chess and snakes and ladders were created in India. They also invented polo, and playing cards. They practiced martial arts, wrestling, and fencing. For the nobility, hunting was a favorite pastime.. Brain Box: How should the Gupta Empire be remembered today?